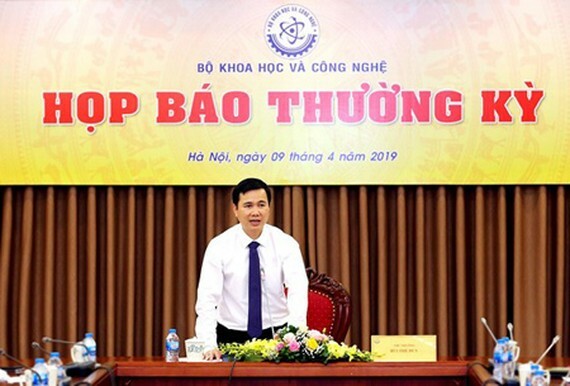 Minister of Science and Technology Chu Ngoc Anh affirmed in the press conference of this ministry for the first quarter of 2019 yesterday that the adjustment of several national policies has signaled enterprises are considered as the focus in the innovation process. Deputy Minister of Science and Technology Bui The Duy also reported that the ministry has tried its best to implement Resolution No.1 and No.2 issued in 2019 by the government with the guideline ‘discipline, integrity, action, creation, making breakthroughs, and effectiveness’. MoST is also providing support for enterprises to research and apply new technologies or obtain technological transfer into manufacturing; to develop products in accordance with production value chains; to start up new companies. Simultaneously, MoST is examining and restructuring national scientific-technological programs where businesses become the center in the national innovation and creativity system; applying state-of-the-art technologies; paying attention to commercializing research results; fostering quality evaluation activities; protecting and exploiting intellectual property for the social-economical development and globalization; improving the commerce environment in the nation and the national competitiveness in 2019 with the guidance to 2021. Deputy Minister Bui The Duy announced the grand opening of the IoT (Internet of Things) Innovation Hub, sited in the Hoa Lac Hi-tech Park in Hanoi on April 10. This IoT Innovation Hub is established to offer an innovative platform for researchers and startup people to perform their work, speed up the application of IoT in Vietnam. This is the first center in the nation that can connect universities, enterprises, and research centers to develop and pilot IoT applications and then commercialize them in the near future.